This hearty, Argentinean Malbec is quite robust! Its delightful nose contains pleasing plum and vanilla scents. The wine itself has prominent spicy flavors–very characteristic of Argentinean Malbecs–as well as those of dark plums, blackberries, and traces of vanilla. The finish is quite good, lasting well over 40 seconds, and includes satisfying blackberry notes. This is a wine sure to delight fans of “spicy” and “peppery” wines. Often found at $12 a bottle, Malbec enthusiasts will want to try this affordable, solid example of a Bordeaux varietal that falls somewhere in-between a Cab and a Merlot. Though the label mentions this wine is a good fit for “barbecue meat,” be careful of the barbecue sauce you use. Sweeter sauces will not compliment this wine, but certain pasta sauces and rich cheeses certainly do. Any dish incorporating cranberries, unsweetened or semisweet, also makes a surprisingly good match, as will cashews. Of course, this spicy red is quite good on its own, so enjoy a bottle of Jelu Malbec 2008 today! If you’ve been faithfully trying all the wines we’ve reviewed here recently, you may find yourself with a few partial bottles that need storing! We carry a variety of wine preservation and dispensing systems to suit a range of needs, from the casual drinker (try the Pek Preservo for a single bottle–also a great gift!) 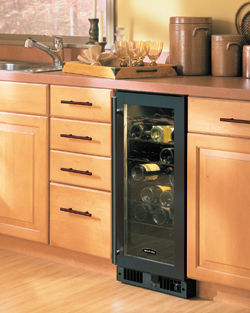 to home (or restaurant) wine bar (check out the WineKeeper systems). These systems use argon or nitrogen to prevent oxidization of your open bottles.